I am trying really hard to be healthier these days. And not the college type of ‘healthier’ that involved sugar-free, fat-free EVERYTHING. (Well, except the pizza, pitas and Chinese food I gorged from 2 am – 4 am.) Let me tell you, those chemical-y (MENSA, I am so not kidding. Stop judging.) fat-free, sugar-free, “diet” products, especially the frozen yogurt, will MESS with your stomach. Anything that makes you feel that sick can not be good for your body. Honestly. No, I am talking truly healthier. Like, I am working on cutting out food from our groceries that we don’t really need, so that I have some room in the budget to buy more organic foods where it really counts. Dairy, proteins, thin-skinned fruit and veggies. And I am talking about eating more vegetables (Even at breakfast! We all now love kale shakes – thanks M!) Also, making sure that the fats we eat are the good kinds. The omega-3 kinds. I have talked about this before, but this will actually save you money in the future when your kids get academic scholarships. You’ve got to think big picture here, folks. I am not saying we never, ever eat fast food or never eat burgers Five Napkin style, or that we only eat organic food or anything. I mean, it’s great if you do that. But I haven’t figured out how to make that a reality at this point. I am just saying that I am trying. Something about having kids makes you want to try to do everything better. To be more generous, more kind, more fun, harder-working, and yes, healthier. Especially when you are putting food into tiny, pristine bellies that is then being used to grow little baby boys into big, strong men. None of us are perfect, but it makes you want to try, that’s for sure. But now I see. Thanks, mum. 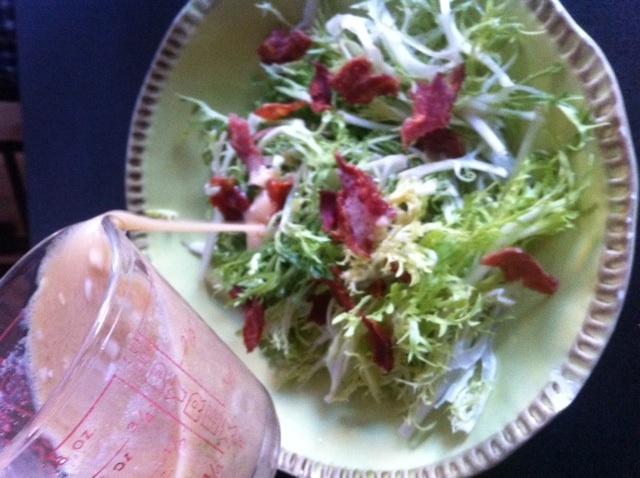 And in tonight’s meal, I used another of my mum’s recipes: her famous French vinaigrette. Which literally could be found in a Pyrex cup on our kitchen counter Every. Single. Day. She never measures out the amounts, so I had to kind of guess the amounts in the recipe below, but you can experiment and make it your own. Although, no matter how I make it, there is something about my mum’s that is better. Even when I use canola oil, like she does, it doesn’t taste the same. My husband suggested I start doing it in a glass that looks exactly like her’s but it still didn’t work. (Shockingly.) Oh well, at least it gives us a reason to go visit them. And the salad is a twist on one that we get every time we go to a French restaurant: The Frisée salad with poached eggs and lardons. 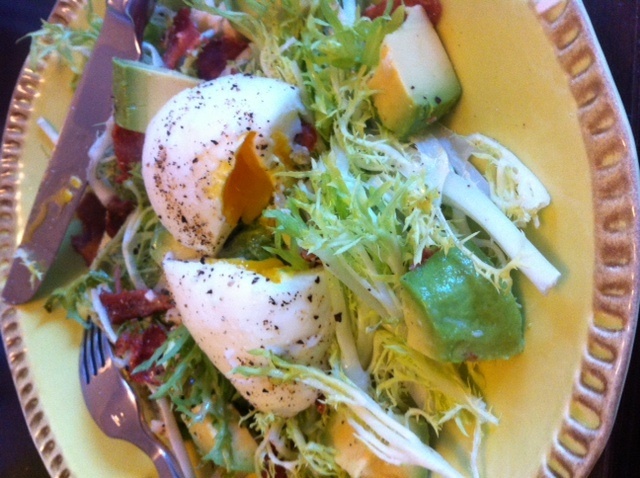 In my recipe, I switched out lardons for turkey bacon, getting rid of all of that fat…and then bringing fat back into the recipe in the form of avocado and olive oil. And if you have kids, like mine, who aren’t ready to eat just a salad for dinner yet, simply put a whole egg (shell on) in the boiling water with the poaching eggs and cook it all the way through. Throw it on top of some noodles with the turkey bacon and avocado. Then add butter… or even the vinaigrette! I just got this poaching aid for a dollar or two at Crate & Barrel, but I always used to just poach straight in the water. Just make it a slightly stronger boil if you are putting them straight into the water, so that they will hold their shape well. While the water is coming to a low boil, wash and dry the lettuce and out it on a plate or wide bowl. Cook the turkey bacon (I found inexpensive organic, nitrate-free, applewood smoked turkey bacon at Trader Joe’s) and then crumble it into pieces over the lettuce. Dice the avocado and put it on top, as well. Make the dressing: Chop up a few cloves of garlic (anywhere from 2-5, depending on how much you like garlic). You can use a garlic press, if you prefer. Put them in a glass, bowl, or other dressing container. Add a spoonful or two of Dijon mustard. Add about a 1/4 cup of red wine vinegar and mix. Then slowing drizzle in the oil, while whisking until it looks nice and blended and creamy. Maybe an 1/8 to a 1/4 cup of oil. My mum uses cold-pressed canola oil, which works just as well. (Better, if you ask my husband. But he’s a kiss up.) The amounts here are all flexible. 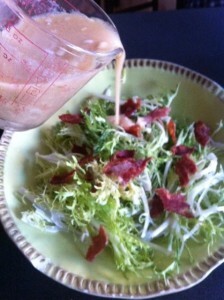 Make it a few times and see which ingredient you want to taste more/less of in your French vinaigrette. Pour the salad dressing on each plate of salad. Crack eggs 1 or 2 at a time into the low boiling water, using an egg poaching aid, if you have one. You can do it straight into the water, too, though, just turn the heat up a nudge. 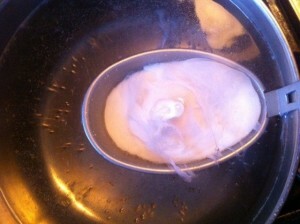 When the eggs look opaque, they are done. Scoop them out with a slotted spoon (or just lift out your poaching aid) and put 1 or 2 on top of each salad. 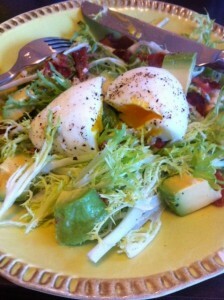 This entry was posted in What's for Supper Wednesdays and tagged avocado, French vinaigrette, Frisee salad, healthy, poaching eggs, turkey bacon. Bookmark the permalink. Follow any comments here with the RSS feed for this post. Post a comment or leave a trackback: Trackback URL. French Vinaigrette: About 1/4 C. red wine vinegar, add bruised or minced garlic cloves (the vinegar will “cook” or take the rawness out of the garlic in a minute or two. Then, add about 1 T. Dijon mustard and mix with fork. THEN, slowly whip a drizzle of cold pressed Canola oil to this using fork or whisk. The mustard will emulsify the oil and vinegar to be as one and the garlic adds some zip. It’s a good marriage. One other instruction for the French Vinaigrette: this recipe makes one cup… a one cup Pyrex pitcher is perfect to measure and hold it. Well, I guess you always DID measure….I just never thought to watch closely or ask. Huh…imagine that. And the Pyrex had a purpose! I mean, my goodness. Who knew? This looks awesome! And i hear you on the whole eating healthy thing. I am trying to do that, too. For 2 weeks, I’ve been eating spinach salads with tons of veggies and fruits, some chicken and walnuts. I feel more nourished. Now I’m working on the kids. I think it will be easier when the veggies they like are in season and actually taste good. I also eat pita chips between the hours of 2am and 4 am so I feel you on that…I have a notebook titled Annie’s Blog Recipies and I plan to make every single before I see you next so I can tell you how brilliant your cooking is! Can’t wait for the next taboo/balderdash night…and hopefully you’ll whip up a meal for us too! P.S. I couldnt help myself…your children will have red sox attire in no time…nothing big but it is on the way. oooh this one looks good. i too am trying to be healthier–but really what this means for me is not having sugar and dessert every day. i have been really enjoying making all of your healthy homemade dishes and we have saved money by not eating out (i haven’t been out to eat in SUCH a long time–which was a goal of mine) BUT now I am struggling with Brooklynn who only wants to eat grapes for dinner…or spoonfulls of peanut butter… so say a little prayer for me. i am definitely going to have to go back to giving her shakes (like M’s for dinner). Emily, do you seriously have that notebook? If so, that is so fantastic…and by that I mean flattering. I am seriously considering your cookbook idea and am thankful that you are handing over such a possibly lucrative idea to me, rather than use it yourself. …Although perhaps you could have done so in a more private way? Now Julie, Erin, Nina, or that mysterious 4th blog reader lurking out there are going to steal this idea. Bummer. Feels good to know I’m not in this whole ‘attempting to be healthy’ thing alone!